You may be wondering what the purpose of Google Analytics is. Well, when it comes to marketing for associations, it is a highly effective tool for collecting and tracking important data connected to your website. When interpreted, this data is an indication of who is interested in your association, and whether your digital marketing efforts are working. 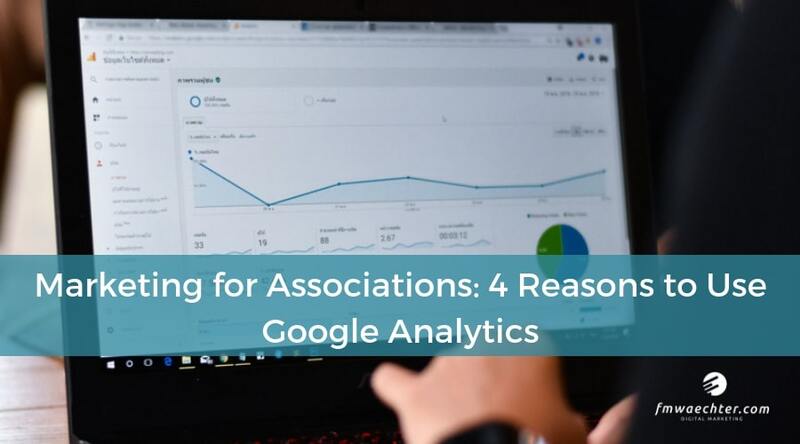 Let us delve deeper, here are 4 reasons as to why you should be utilising Google Analytics, especially when it comes to marketing for associations. The analytics tracking features on Google Analytics are an effective and accurate way to pull data from your digital marketing efforts. One of them being the website tracking tool, which is how your association can accumulate and analyse even more specific results. Want to learn how to set up analytics for your association’s website? It is not as difficult as you may think. Thanks to Google’s usability, you can track your association’s website, and any other relevant websites quite simply. By using website tracking, you will get excellent results, enabling your association to grow efficiently through informed business decisions based on the demographics of your website visitors. Google Analytics offers real-time reports so you can see exactly is on your site at any given time. This is very useful when it comes to marketing for associations because it gives you the opportunity to look deeper into your association’s audience. Why would you want to do this? To gain a deeper understanding of your audience’s demographics. This way, you will know who to target in future. It gives you all this information, enabling you to build even stronger digital marketing strategies for forthcoming events. It also allows you to view the most visited pages on your website, giving you a clear picture of what your audience is interested in – identifying what resonates with them. When I speak of demographics, I am referring to where your audience lives in the world, what their age group is, their education level, income level, as well as their gender. This is valuable information that every association needs to know. You should be building everything around this. Furthermore, these real-time reports show you what attracts your audience, from keywords to referrals. Analytics can be confusingly expansive. That is why placing this data into categories will make the process of translating it much simpler. Google analytics has the solution for this. By using the Google Analytics’ URL Builder you will be able to create UTM parameters easily. By doing this, you can gather information on behalf of your association about the overall efficiency of your marketing campaigns, while understanding where they are most effective. With this tool, you can add parameters to any of your website links. Additionally, it gives you options on how to track your links. From your campaign sources, such as the social platforms you are using or even based on the format you are using to host your links such as a banner or email. The best part of it all? Google Analytics is mobile friendly – perfect for the travelling professional. 80% of internet users have migrated to mobile and of course, Google has adapted to this extraordinarily well. Google Analytics for mobile allows us to measure and optimize their collected data on-the-go. This is beneficial because it means you do not have to stress about finding a desktop or even carrying a laptop with you while travelling. There are two ways to utilize Google Analytics on a mobile device. To start, simply download the app for iOS or Android. Yes, there is an app – could it get any more convenient? In summary, Google Analytics gives you a clear picture of where to focus your digital marketing efforts in order to maximise your association’s success. It is imperative you integrate it into your futures strategies as it allows you to see how many visitors your website gets, but more importantly, how many of those visitors bounced. This is incredibly useful because it shows you how many of your visitors started your customer journey but failed to find what they were looking for. Sometimes, all it takes for a visitor to bounce is the usability, navigation or design of your website. In short, it arms you with the tools to earn new members and retain the members you already have. If you are looking to give your association a complete digital transformation, get in touch with me.